One of our newer members, Ethan, is hoping to start a side-group for RPG board game fans starting in 2019. This group would be limited to four total players that are willing to play through a full campaign of Descent: Journeys in the Dark (an RPG board game with gameplay similar to D&D). A full campaign would span over several sessions with each session lasting between 3-6 hours and he can only host on Saturdays. Sessions would not necessarily run every Saturday, but once he gets 4 volunteers, the group can spread the sessions out as needed. Sessions would begin in January of 2019. Once you send us your email, we will connect you with Ethan directly. Ethan typically attends our Thursday night game sessions at Arlington Central Library. So, you could also inquire about it at one of those sessions. 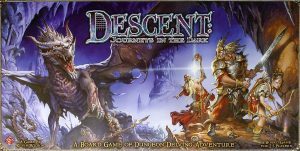 I just picked up Descent 2nd ed myself and i am interested in playing. Unfortunately I would only be available Sat evenings after 4 pm as I work every weekend during the day. However if you are playing in the evenings and have room for one more adventurer I ‘d love to part of the group.